Christmas is the most magical time of the year, unless you are the one who gets to climb up the ladder to install your own Christmas lights . With many years of experience working with ladders to draw from, we can properly and safely get your lights up and down leaving you with a stress free Christmas. Our commitment is to bring value and beauty to our holiday lighting clients every year with quality work, creative ideas and true customer service in an often rushed season, and to bring light to the spirit of the holidays!! We want your lights to be a source of pride and excitement, not a hassle. Once you contact us and arrange a free estimate, we will come out there promptly offering you a free quote on what it is you would like to do! Christmas light takedowns will be billed in or separately as discussed. However, if you need a little bit of help with a design idea, we are more than happy to offer some free suggestions as well. We offer and can provide you with lights, fixtures, and hardware necessary to finish the job properly. We offer Christmas light installations to all residential homes regarding size, height etc. What’s fantastic about what we offer is that you won't have to worry about climbing a ladder any more or going back up to change or fix a burnt out light . This is all included in our free, no obligation quote. 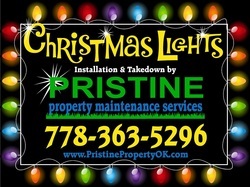 Our goal is to offer you a stress free Christmas light installation and display that you can be proud of. Weather you have your own lights and just simply want us to put them up for you or you would like to purchase some new lights for different colors and designs we are happy to help. Your Landscaping offers the most options for creative decorating. We can offer several options for the trees, shrubs or features on your property. We always take great care when working on a client’s landscape. Generally lights will not damage trees or shrubs, however if a landscape feature is new or in weak health we will recommend skipping it for the season . If you are in Kelowna BC, what better way to show some of your company’s Christmas spirit while drawing some valuable attention with letting pristine set up a beautiful Christmas light display for you. A professional design that is grasping and expressive can really get your future clients talking .Pristine Property Maintenance will offer you a free quote showing you how reasonable of an investment this can be. A beautiful Christmas light display could be the ticket to peaking your client’s interest and bringing them through the front door. After the Christmas light installation and holidays, we will take them down for you (when requested) and properly wrap and box them!